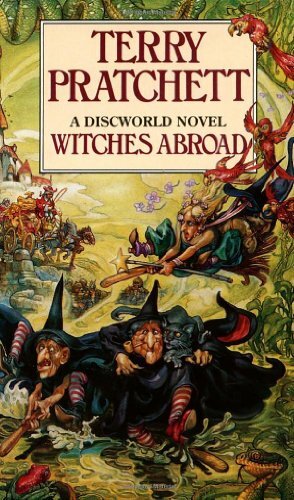 Witches Abroad was the Discworld novel I read just before I discovered how wonderful the Discworld is. I liked it well enough to decide that I would try The Wee Free Men when the opportunity arose, so while I say that it was The Wee Free Men that taught me I love Discworld, Witches Abroad was a necessary precursor. So it was interesting to read a second time, fully enamoured with the world rather than slightly skeptical. Let me say, too, I think this is one of the better Discworld novels I've read, and is right up there with The Wee Free Men. Upon the death of witch and fairy godmother Desidirata Hollow, witch and wet hen Magrat Garlick inherits a magic wand and a goddaughter. The goddaughter is named Ella and lives in Genua, a fair ways away from Lancre, and Desidirata instructs Magrat that Granny Weatherwax and Nanny Ogg are not to join her on her quest to make sure that the serving girl doesn't marry the prince. Of course, that means they will (precisely what Desidirata intended) and so the three set off on a journey to foreign parts. On the way they encounter several stories run amok, and find themselves pitched headlong into a nightmarish fairytale orchestrated by a formidable -- and strangely familiar -- foe. I love the witches. My inclination is always to say that my favourite Discworld character is the one with whom I've most recently spent time, but the truth of the matter is that Granny Weatherwax tops them all. Rincewind I love, and Sam Vimes is great, and DEATH is wonderful, and Tiffany Aching will always hold a special place in my heart. But Granny is fierce and intelligent and cranky and full of depth and maddening and flat out terrifying. I feel comfortable with her, like I'm in good, if uncompromising, hands. And this is her book, very much, and so that makes this an excellent book for me. She has a number of moments in this book that are those rare moments in a book so on pitch and on character that they are perfect and they take my breath away. Magrat, on the other hand, is a character I often find to be vaguely irritating and uncomfortable... largely, I think, because if I was a Discworld witch I would be Magrat, and it's not exactly a flattering comparison. She is good, and well-meaning, and thoughtful, and kind, which is all lovely, but unfortunately everything is out there on the surface; she doesn't think deeply, though she likes to think she does, and she doesn't notice things because she's so busy trying to understand. I like to think I would be a Granny Weatherwax type or even a Nanny Ogg type, but the truth is that I would be a Magrat. I will work with this, I suppose. I have a suspicion that in this world, which is spherical and orbits the sun, being a Magrat isn't necessarily a bad thing. The book is very much about tensions: tensions between appearances and reality, between characters, between youthful enthusiasm and experience and wisdom, and between narratives and reality, to name just a few. The book is fraught. It's also really, really funny. Tension is offset by things like houses falling on witches and sly homages to (or lampooning of) familiar tales. It's also about narratives, and how powerful they can be. Pratchett makes it explicit: fairytales and other stories are entities that have agency in Witches Abroad, creatures that, tentacle-like, attach themselves to people and events and twist them so that lives turn out in a particular way -- so that the story can have a "happy ever after." But as Granny points out, there is no such thing as a happy ending. Things keep going after the events in the story come to a close, and ever after is a long, long time. The story takes away the agency of the people involved, and nothing makes Granny Weatherwax angrier than something taking away an individual's agency to live and/or screw up their lives as they see fit. We don't have fairytales running around amok (do we?) but we do all have narratives running in our head, stories we tell about ourselves and other people, stories about who we think we are, and who other people think we are, and how we behave in the world. These stories can be extremely powerful; they can be comforting, because we can carefully slot everything that happens to us into our personal narrative. They can also blind us to realities, and in their most vicious, pernicious form they can be incredibly destructive to ourselves and those around us. I spent a lot of time this re-read thinking about how our own personal stories can remove agency from us, if we let them and forget that the only reason they have power is because we feed it to them. Ah, Discworld. Always making me think a little deeper than I realize I am. I'd happily recommend this to the right people (namely, fantasy fans with a sense of humour). This book pulled me out of a slump, and now that I've re-read it once and found it still excellent (perhaps even better the second time) I'll be coming back for more. Are they in a specific order or can you just pick them up randomly? I found the exact same thing before I started reading them, and despite the fact that I love love love them now, I *don't* think they're for everyone. My husband finds them a "bit too cute" for his tastes, though he's not a fantasy fan at all so there's a piece of the puzzle he's missing too. That said, I think The Wee Free Men or Pyramids are both excellent places to start. You can read the series in order (there are several "sub-series" within that do bear reading in order because of character developments, as well as stand-alone novels like Pyramids) but you really don't have to, and I certainly wouldn't start with the first two, which are fun but certainly not the best of Discworld; they are exercises where you can watch Pratchett just getting warmed up, though. I am enjoying reading the books so much, but I can see listening to the series once I've gone through them once; I imagine I'd get different things out of it. Mostly I love listening to them, but I have to say that it's harder to savor those amazing turns of phrase with the audio books, but they are really fun read out loud, and I'm now hooked. This is the thing -- I tend not to have as good an audio memory as I do a visual memory, so I worry that I will either miss or forget things that reading would have really stuck out for me. It's kind of fun to think, though, that I will be able to experience the whole series again in a different way. I knew your review of this would be a treat to read! I think Granny Weatherwax is my absolute favourite Discworld character too. I love all the other ones you mentioned too, but Granny is just a masterpiece. Thanks Nymeth, I'm glad you enjoyed. :) With Granny, I think in person she would scare the pants off me, but she's an awesome character to read about in a book.